Holidays in the monument combines heritage preservation and tourism. Historically valuable Bauzeugen be taken, gently renovated and rented as apartments. The model allows a double win: The monuments received a new future and the holiday guests experience a stay in an exceptional building. The idea is realized by the foundation Ferien im Baudenkmal (FiB), which was founded in 2005 by the Swiss Homeland Security. Parking: The parking lot is located directly at the house and is not covered. The access to the house is guaranteed. In winter, it can happen in heavy snowfall that the roads are not easily passable. Winter tires and snow chains are then an advantage. Public transport: By train to Scuol, from Scuol Staziun there are local buses. It is 200 meters from the Bügl Grond stop to the Engadinerhaus. Number of persons 5: There is a cot (up to 2 years) available. The house can accommodate five guests (plus baby). The apartment 2 can be found in the 2. Floor. Upon entering one stands directly in the living room with an open kitchen. Next to the kitchen is a separate bathroom. There are two double rooms and one single room available. If necessary, the apartment 1 and the apartment 2 can be rented together and then offer space for 11 people. The floors are made of wood which is why we recommend good slippers. Garden: There is an outdoor space in front of the house available, this is shared with the guests of the apartment 1 together. WLAN: Is available, also a TV. Open: The house can be rented all year round. Altitude: 1300 meters above sea level. 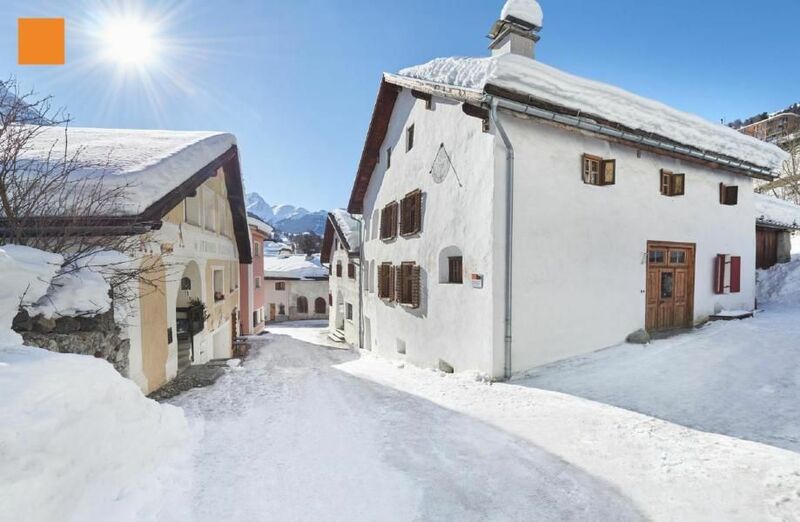 The Engadine House is located in the old village center of Scuol, near the Bügl Grond Square, from whose fountain natural mineral water is bubbling. The exterior walls are built of stone and have small, funnel-shaped window. The ceiling and the interior fittings are made of wood. As is often the case in historic Engadine houses, the ceilings are partly low. The house is comfortably furnished. Kitchen and bathrooms are in excellent condition and are very visually appealing. The selected with care interiors with contemporary furniture, z. T. from domestic production, contributes to the harmonious and cozy atmosphere in the Engadine house. The apartment accommodates up to five people in three bedrooms. The old substance is still omnipresent. 1994 was carried out by means of conservation and the local architect Jachen Canal a complete renovation. new elements have been only sporadically with targeted interventions installed. So a second apartment was on the upper floor. The true age of the house is best guess at the basement ceiling. The built-up beams were beaten with an ax by hand from tree trunks. This craft is very old. The new bathroom in 1994 in in separate elements in the rooms. The new parts do not attempt the old anzubiederern but speak formally a new language. The larch planks used in the new fixtures are former boards from the Kuhstahl. 2009 was a further smooth renovation that created the entrance redesigned and separate entrances to both apartments. At the same time the house has been equipped with high quality furniture. The old stoves were subsequently electrified, so that even without manual heating an optimal climate is guaranteed. The Engadine House is a monument that has been renovated with great respect for the existing substance. The tenant is aware of and meets the object with care. Furthermore, although technologically equipped contemporary, do not comply with certain functional details now common standards and pose a possible safety hazard. These circumstances are known to the tenant. The owner, e-domizil and the foundation Ferien im Baudenkmal disclaim all liability. Final cleaning: once per object costs of 163. 32 EUR (compulsory). Internet (per object and day, included in the price 0 EUR). Cot (per object and day, included in the price 0 EUR).